NASA’s MAVEN mission presented in its initial science findings a key factor that played a role in the loss of most of the Martian atmosphere and the transition of Mars from a warm and wet environment capable of supporting life to the cold, deserted world we see today. 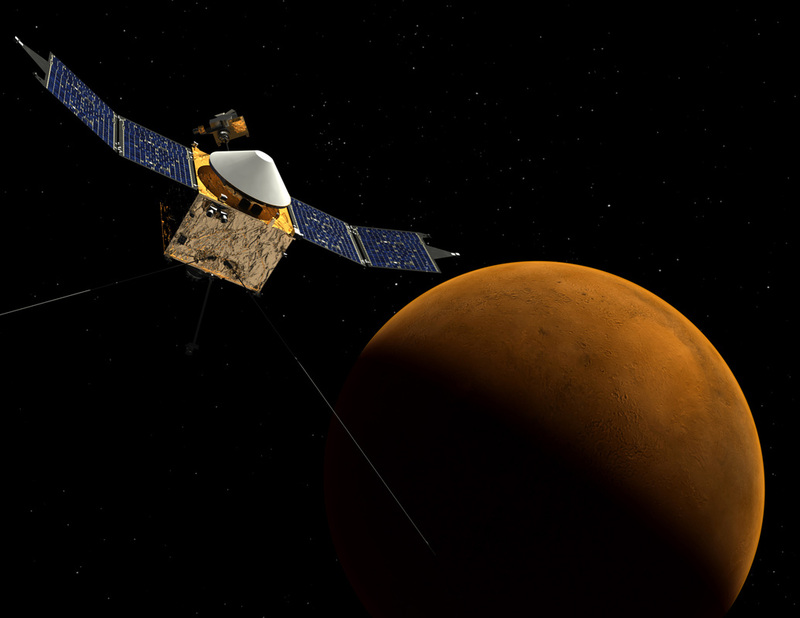 Data delivered by MAVEN, now approaching the end of its one-year primary mission, showed that the Martian atmosphere currently is losing gas to space, stripped away by the solar wind. 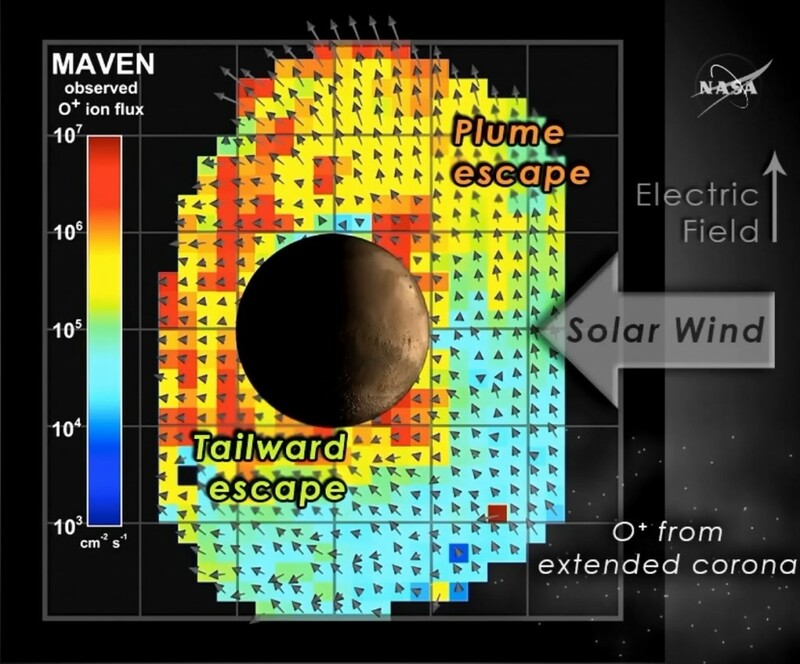 Atmospheric loss driven by solar wind interactions of the upper atmosphere has been a leading theory heading into the MAVEN mission and Thursday’s announcement represents the validation of this hypothesis based on data collected over the course of MAVEN’s first six months in orbit around Mars. The findings of ongoing atmospheric loss at Mars due to solar wind give scientists plenty of work to look into the past and extrapolate how this mechanism of gas loss evolved in the early stages of the Solar System when the sun was much more active and Mars had a much thicker atmosphere. 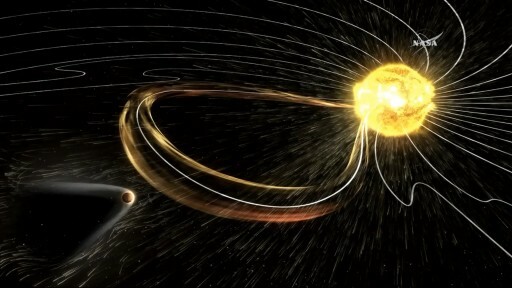 Scientists used data delivered by MAVEN’s charged particle detectors to measure the inflow of solar wind, consisting of a stream if electrons and protons traveling at extremely high speed. 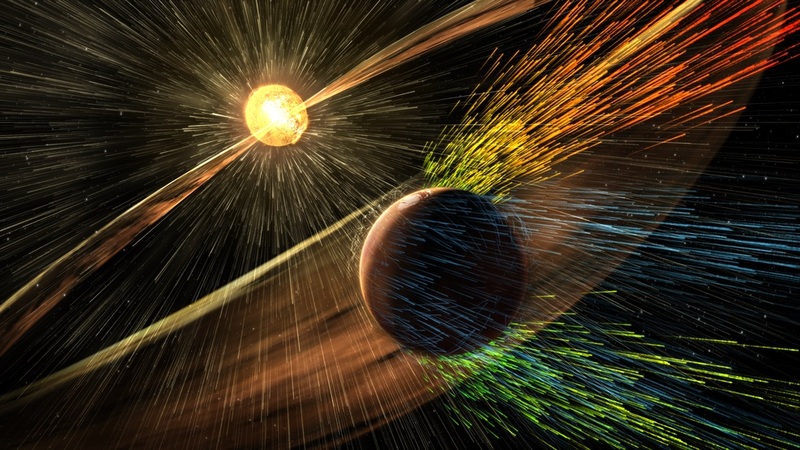 When coming into contact with the Martian atmosphere, the magnetic field carried by the solar wind can generate an electric field in which charged particles can be accelerated to energies high enough to overcome their bond to the planet and escape into deep space. MAVEN data shows that the solar wind strips away gas at a rate of 100 grams per second, only taking into account high-energy charged particles. 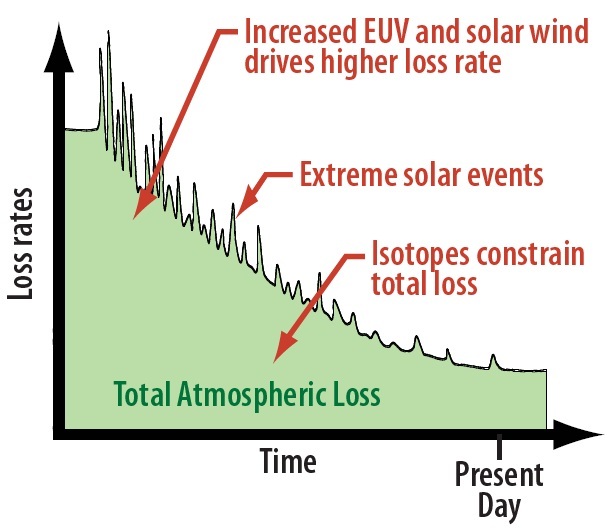 Measurements of low-energy charged particles and neutral species are still to be analyzed and added to the atmospheric loss models which is likely to increase the loss rate. 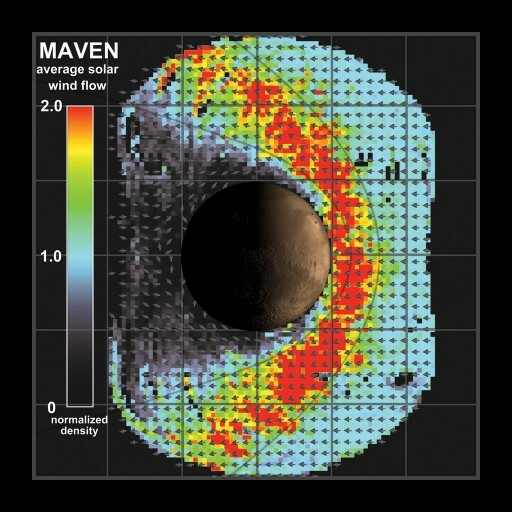 MAVEN also had the opportunity of measuring changes in loss rate when Mars was hit by solar storms. A higher intensity of particle inflow from the sun led to a loss rate at Mars ten times higher than its average rate. Orbiting Mars in an elliptical orbit allows MAVEN to study the loss of particles at different locations close to the planet and further out. It was found that atmospheric loss occurs in three different regions, down the tail of the planet where the solar wind flows behind Mars, above the Martian poles where a Polar Plume is formed, and from the very upper reaches of the atmosphere, a cloud of gas extending around the planet. Completing a quantitative analysis, the science team determine that almost 75% of the escaping ions are lost from the tail region while nearly 25% of ion loss occurs in the plume region – gas escape from the extended cloud accounts for only a minor loss rate. Beyond the findings announced on Thursday, the MAVEN science team will attempt to use the models of current atmospheric loss and extrapolate them into the past to see how solar wind interaction acted on a thicker atmosphere. Mars, once a warm, habitable place, began losing most of its atmosphere when it cooled down and lost the protection of its global magnetic field that shielded the planet against the charged particles flowing from the sun. 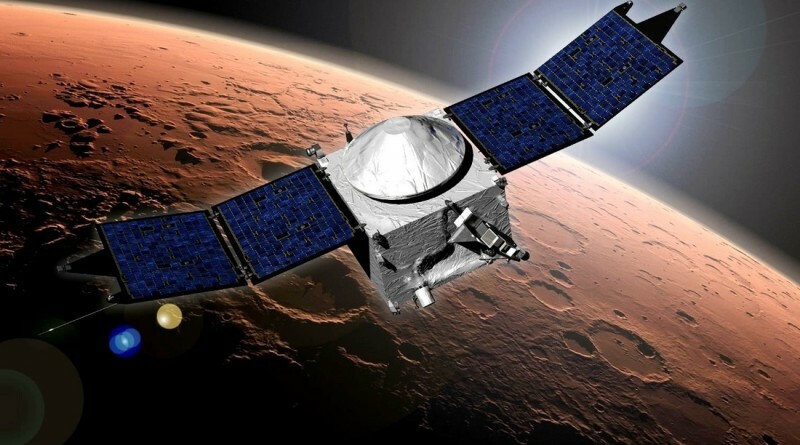 MAVEN will also provide insights in other possible loss mechanisms such as photochemical reactions in the upper atmosphere, thermal escape or sputtering processes. Scientists also hope to couple MAVEN’s measurements with the Radiation Assessment Detector of the Curiosity rover and the Mars Reconnaissance Orbiter’s Mars Climate Sounder. The Curiosity rover found that an ancient Mars had an abundance of liquid water on its surface in flowing rivers and stagnant lakes. Flowing water on the surface indicates that the Martian atmosphere was once much thicker, creating the required surface pressure and temperature for liquid water to exist over extended periods of time. Recently, the Mars Reconnaissance Orbiter found signs that liquid water still exists periodically on Mars. Images acquired by MRO’s sharply-eyed HiRISE instrument show downhill flows referred as recurring slope lineae that often appear as darker streaks on steep hills. Additional data delivered by the Compact Reconnaissance Imaging Spectrometer for Mars showed the presence of hydrated salts within the downhill flows. The leading theory, based on the finding of downhill flows containing hydrated salts, is that the salts, particularly perchlorates known to be present on Mars, keep sub-surface water from freezing even when conditions are extremely cold at around -70°C. The seasonal flows present in the warmer seasons on Mars are most likely caused by a water-based brine and become visible when enough water makes its way from the sub-surface flow up to the surface. Having delivered its first key results, MAVEN will finish its one-year primary mission next week and head into an extended mission. Over the course of its first year at Mars, MAVEN completed four deep dip campaigns, diving deeper into the Martian atmosphere for a period of days for the study of the composition of the upper atmosphere using its nine science instruments.